Little Mrs. Married: christmas favorites! Time for another Blog Hop with Girl Talk. I heart Girl Talk. Please check it out if you haven't visited before! Today we're discussing Christmas Favorites! This should be easy. I love Christmas!! 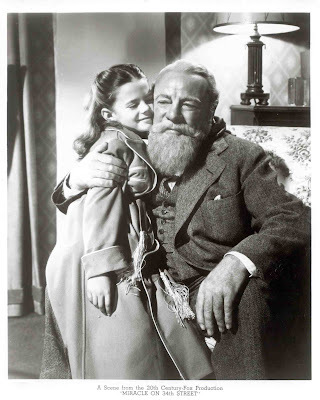 My favorite movie has always been Miracle on 34th Street. What is your favorite Christmas song & why? My favorite Christmas song is O Holy Night. I just love it. It's beautiful. My favorite person to sing it is Mariah Carey...best version of the song EVER! Seriously. LOVE. IT. What is your favorite ornament or Christmas decoration? I love Christmas with my immediate family (plus Brad & Mike). We just have a night together, where we eat appetizers & desserts, listen to Christmas music, open gifts & perhaps watch a Christmas movie. It's just the 6 of us, and it's nice. Other than that, i'm not sure. Most of the traditions i had growing up are over now because i'm an adult & things change, ya know? But i'm excited to start traditions with our own family. Why don't you play along too? Just answer these questions in your own blog & link up here! Such a sweet Christmas memory :) I remember waiting with my sister for the time when it was okay to wake my parents up haha. I like the appetizers and desserts idea! I love Miracle on 34th Street also. The original and the newer version with the little girl from Mrs. Doubtfire (can't remember her name). O Holy Night seems to be a favorite among many! So fun! I love the Christmas memory. Ok, after you watch A Christmas Story, you are going to have to post what you thought about it. I still can't believe you've never seen it! gah, no elf? you are going to love it! I actually have never seen the original Miracle on 34th. Maybe I will have to get that one for Christmas Eve this year! ELF!!!!!! I love watching it at all times of the year! I believe you will love it as well. Your Christmas memory is irreplaceable :) it's so sweet and perfect!